360 Spherical cameras have come onto the camera market in a big way. They offer audiences a unique scene in which they can take full viewing control and watch the video the way they want. Garmin has now entered the 360 market with their latest addition to the VIRB action camera series the VIRB 360. Garmin has arguably taken the middle road in the 360 market, entry level 360 cameras can range from $360 (Samsung Gear360) – to the Nikon KeyMission 360 Action Camera ($699). The VIRB 360 at this point retails for $1099. On the other end of the spectrum, professional 360 cameras can cost from $2000 up to $60,000 (360Precision I’m looking at you). Moving into the professional range is a significant investment and not an option for the average consumer. The price point for the VIRB places it between the area of professional and consumer grade 360 cameras. 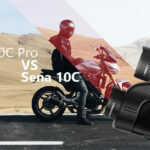 I’ll go into detail on the camera’s specification later but with 5.7K capable RAW shooting and 4K shooting with auto stitching it establishes itself as a leader in the premium consumer product range of 360 cameras. Don’t have time for the whole article, just read this for a quick summary. The VIRB 360 can shoot 5.7K Raw, 360 Auto Stitched 4K and 360 1080p. 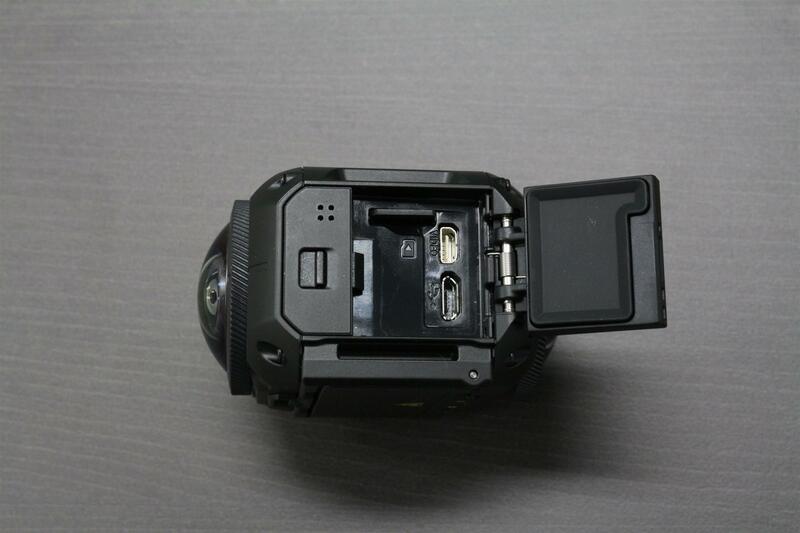 It can also shoot video only via the front and rear lenses. The camera also has multiple photo modes including single, burst (20 frames in one second) and time-lapse. At 4K the camera records about 9.3MB a second or 560MB a minute. This should give you quick idea of the memory consumption this unit will compute so make sure you're equipped for a day of full shooting with large MicroSD cards or a couple of spares. The sensors built into the camera that you'll be able to overlay with the G-Metrix overlays via the App or software are Barometric Altimeter (Elevation), Accelerometer (Force and Motion, Gyroscope (Rotation), Compass Bearing and GPS (GLONASS 10HZ Data Capture). We've included some footage we shot at Mt. Cootha using the VIRB 360 below We shot at the auto-stitched 4K resolution, this was our first major test with the VIRB 360 so plenty refinements that could be made to neaten it up. We haven't used the 5.7K shooting mode yet, we're waiting for Garmin to add the stitching capability to their VIRB edit software. At the moment the unit retails for $1099 RRP* and is available now. Now to get into the details, open the box up and you’ll get six different pieces. I’ll shy away from the camera at this stage (ha.ha) and start with the mounts included in the box. The manual is a standard issue; they keep a digital copy of the product manual anyway so don’t concern yourself too much. 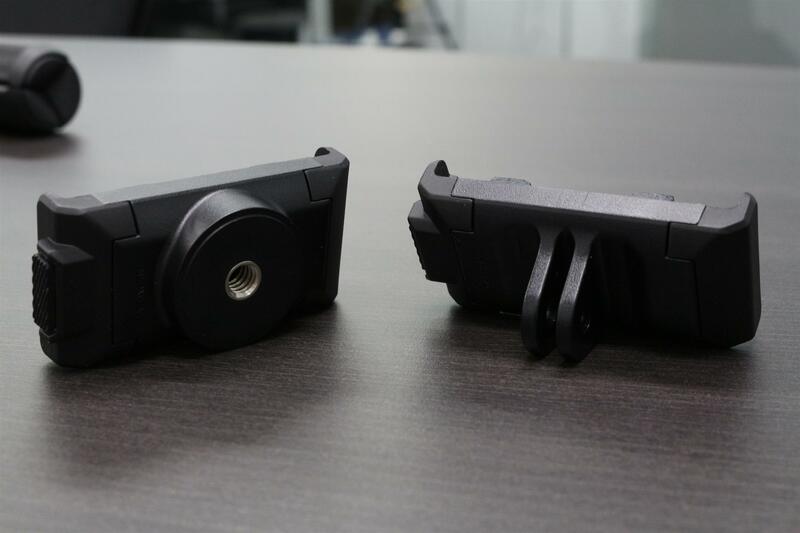 For the mounts, Garmin has included a GoPro style mount which can be used to attach to other GoPro mount accessories. 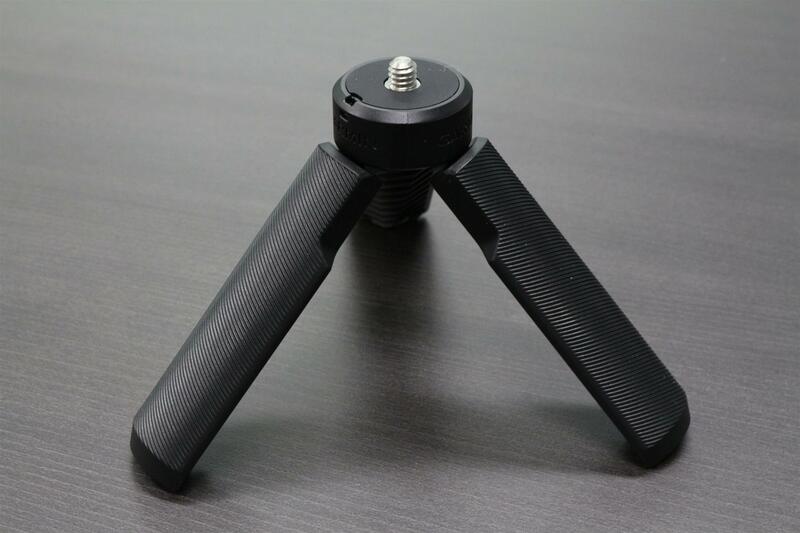 The Tripod style mount fits with the included Tripod and other camera Tripods with the standard ¼ inch 20 UNC threads. The included Tripod I think, is a very handy little addition to the package. It’s great as a little stand for shooting time-lapse or a handle if you’re like me and wanting to walk looking like some crazed scientist testing the video. The charging cable for the unit is a micro-USB. Having a Micro-USB is useful as most consumers have access to this cables for phones or other Garmin devices. The cord is quite short, so depending on your setup at home this might require a different longer cord or an extension. Personally, I’ve been using an extension USB cable as I need the distance to get to the USB ports on my computer. Speaking of charging, from the factory settings, the unit takes 2 hours to 80% and 3 hours to full 100%. Now to the reason you clicked this post, the VIRB 360 is a surprisingly compact unit given its capabilities. The dimensions of the unit are H39.0 x 59.3W x 69.8D (mm) and weigh 160g. The camera is waterproof and rated for 10m. The side of the unit has a clip open panel. This area holds the micro SD card and is also where you can plug the micro USB charging cable. Garmin has also included a micro HDMI port which can be used to output live video from the camera to an external device. We recommend this card mainly as haven’t had a single recording issue yet. Suffice it to say you’ll need a Micro SD card with high-speed write capabilities. As an example, we shot a 5-minute test video with auto stitching at 4K which recorded at 3.15GB before editing. The other side of the unit is the recording button slider, as soon as you slide it forward the camera will begin recording. Alternatively, you can press record using the button on the companion app for the phone. There is also a dedicated photo button on the top of the unit with the left and right arrows buttons. When the camera is recording the two recording lights will glow red. The lights will also flash green when powered up from standby and blue for when you’ve successfully connected via the camera's WiFi. Having four microphones is another impressive part of the device that helps separate it from other competitors. The camera has four microphones placed around the unit which allows for a spatially aware sound effect. Every additional mic supposedly helps pick out wind noise and negate some of the worst of it. When we shot some footage for a downhill bike track, we found that the unit did pick up some noticeable wind noise on the mics but was more subdued than a typical helmet mount setup. 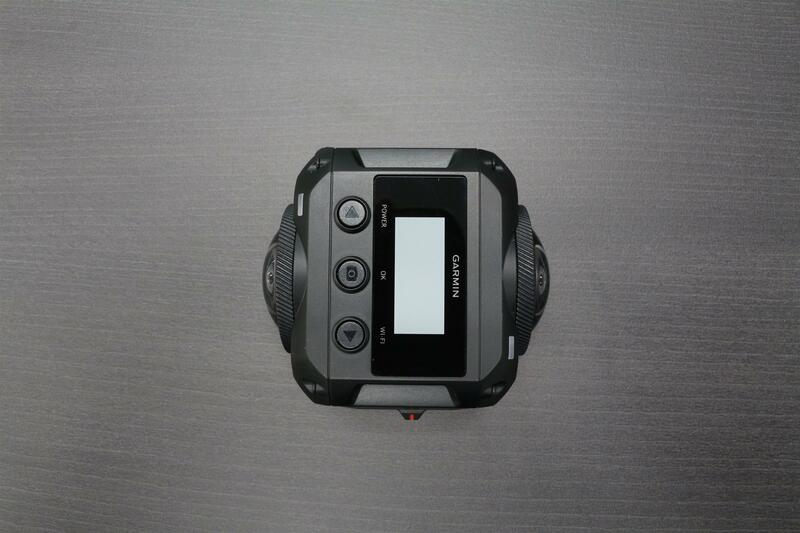 On the top of the camera, the unit has three buttons labelled Power, OK, Wi-Fi. The display on top doesn’t allow for any preview of your footage which would be next to useless on some a small screen. If you have the companion app for your phone, you can preview the footage that your shooting albeit with little latency. The buttons themselves allow for navigation and powering on the device. Moving onto shooting modes for the VIRB360 the unit has five core video modes. You can set the unit to shoot from these modes via the phone app or the camera itself. On the unit, itself you can set up the sensors that pair with the camera. I’ll go into detail about the sensor options a little later. You can also configure the stitch distance to be near or far (Near shooting for indoors or close objects and Far for outdoors). On the phone app when viewing, you can also preview the audio. The standard 360 shooting mode will shoot natively in 4K with auto stitching. I’ve included a sample video in this article to show how well the auto stitches in 4K. As a side note, if you’re uploading these videos and have dealt with 360 cameras in the past Garmin automatically adds all the 360 metadata to the file, so you don’t need to input it manually. For the 5K shooting mode, auto stitching is not an option automatically like 4K only because the unit can’t compute and auto stitch that many pixels on the fly. The current solution for stitching the 5k output include VideoStitch, Mettle and Autopano. Garmin has also made plans to update the VIRB 360 editing software can stitch the RAW video files; we’ll keep you posted on when the update is live. The Timelapse shooting mode can be set to shoot in 2,5,10,30 or 60-second intervals. The mode is ideal for shooting time-lapse scenes for beaches, sunrises/sunsets or cityscapes. Low light situations, however, aren’t ideal for the VIRB 360. An interesting feature that I haven’t tried yet is the live streaming functionality. From a colleague and online speculation, Facebook integration is not ideal however YouTube is apparently quite friendly with the unit making it a much easier experience. The video will display 1280 x 720 at 30FPS up to 5Mbps. 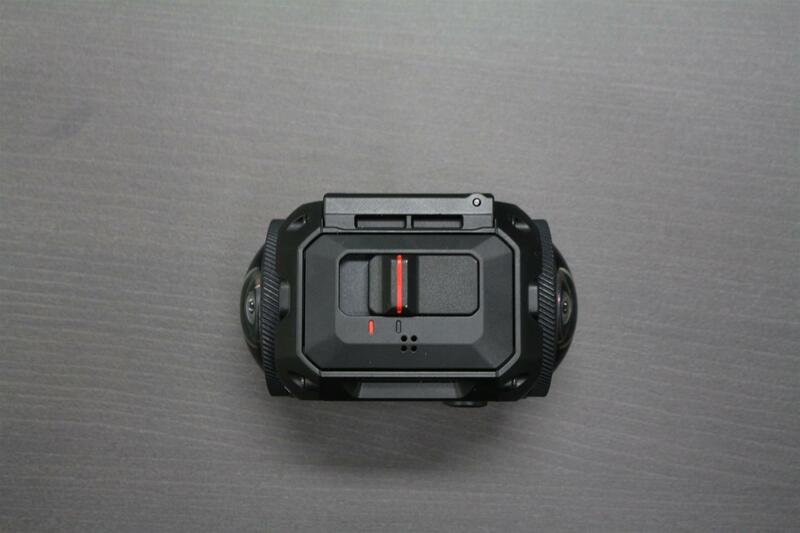 For the camera sensors, it has internal sensors including a Barometric Altimeter (Elevation), Accelerometer (Force and motion), Gyroscope (Rotation), Compass Bearing and GPS (GLONASS 10HZ Data Capture). In addition to this, you can pair the device with your other Garmin products to get details on heart rate, power, speed, cadence, automotive and marine sensors. 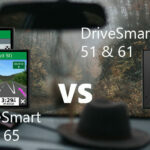 These can be overlayed onto the video when using Garmin’s editing software. To pair the non-internal sensor you’ll need to select whether it is an ANT+ sensor (Garmin Devices and other Health Active devices) or Bluetooth. 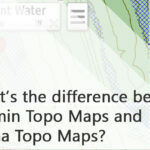 Garmin has done a great job with their editing software that comes with a free software download. When importing your files make sure you select import, don’t drag and drop as Garmin keep the G-metrix and sensor data separate so that it won’t bring that over as well. One of the best features is the stabilisation filter that you can apply to your video. There are four main options for the stabilising your footage: Vibration reduction (Does not correct horizon but fixes vehicle vibration perfect in situations that need to keep the vertical perspective original to the camera. Also located in the stabilisation menu is the orientation option which can you to select the initial orientation that you want your viewers to see. Follow Path (Follows the motion of the camera – In addition to stabilising the footage it will monitor the trajectory of the camera rather than the direction of the lenses. This mode is best suited for the head, handheld or body-worn pretty much anything without a clear frame of reference. Compass Lock (Stabilises the footage like the Follow Path but instead of following the trajectory of the camera it will follow a specified This feature is useful in situations where the camera is positioned on the head, handheld or body worn and there are many changes in direction. Perfect for Downhill Skiing, snowboarding, skydiving. Another cool feature to play with is the G-Metrix overlays available there are a couple of different templates for quick set up. You can also add your gauges in depending on the sensors you have set up. There is also the option to control the appearance of the various measures and displays you will overlay just create a duplicate of the original and then edit away. The editing software also has standard editing staples like transition effects between clips, titles, and Garmin has included some music options to make your video epic (That’s one of the soundtrack titles, I’ll leave it up to you to decide if it lives up to the name). Garmin has also included a map option that loads up a live map of where you were when you filmed and where you travelled during that recording. What’s cool with this feature is when you click on the map displayed it will take you to the timeline moment that you were at that point on the map. I would love for that kind of interactivity to work on YouTube but alas I think that might be off the table for the moment. You can also set sections of your footage to display in slow motion by clicking on the clip you want to slow down and dragging the clip speed towards the turtle. Going into what editing is capable with the Phone App, the app allows for all stabilizations modes and basic G-metrix overlay. Uniquely though it also features a VR mode with Smartphone setups that allow that. The VIRB360 is a great addition to the 360 market that shows you can get good quality video outside of the professional range. It has a plethora of useful sensors and G-metrix overlays to make the best use of 60 footage. The Stabilisation features, in particular, are a great little tool and perform impressively. The whole unit is easy to learn and set up, it can be a little tricky in the beginning but once we got out and testing it was a breeze to record and edit footage. The auto-stitching feature is beneficial to give you a good idea of what footage will look like while establishing your shots. The unit can be pick up a fair bit of wind noise but that's to be expected, and you can negate that somewhat by mounting it strategically. The unit is also quite expensive compared to some of the other consumer grade 360 cameras on the market but the features, video shooting modes including 5.7K and 4K, in my opinion, more than make up the difference.